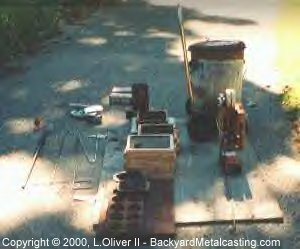 Here is a closer look at some of the components that make up my personal backyard foundry. It may seem crude but boy can I get some serious work done! 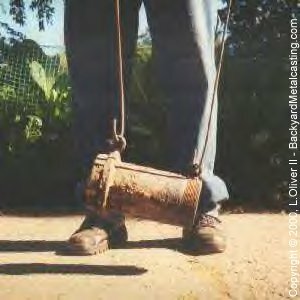 How many people can melt metal and cast it into desirable objects from their backyard??!! The coffee can on bricks (behind the molds) is for collecting the skimmed slag. The two bricks behind the coffee can are for holding the lid when ready to pour the metal. 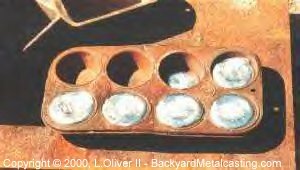 The small bread pans and cup cake pan is for making ingots with any extra metal. Notice the hooks to the left of the photo for holding and manipulating the ladle. To the left of the hooks is the skimming spoon attached to its pipe extension. This is my homemade ladle. I made it from a 4-inch diameter 9-inch long piece of black steel water pipe with a cap screwed on. Notice the rings welded to the side. They are for holding the ladle with the very handy lifting hooks. And finally there is a pouring lip on the front of the ladle. I simply heated it until it glowed orange then used a ball-peen hammer to shape it. Indeed this ladle is quite a masterpiece. I've been using it for almost a year. I can melt about 10 to 12 pounds of aluminum in it at once. I'm not sure how much that is volumetrically, I never tried to figure it out. I'll get back to you on that. This picture is a closer look at the skimming spoon and one of the ladle manipulating hooks made from some scrap 1/4-inch steel rod. This is a giant heap of scrap aluminum that I've collected. I re-melt it which cuts down on waste for the environment and supplies me with free raw materials! Once you build a foundry (which is super cheap to do) all you have to pay for is fuel, unless you collect and burn wood in your furnace making everything free! 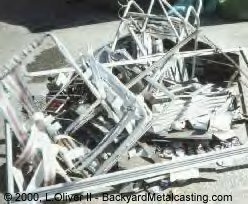 A close look at the picture will show you that I get my aluminum from old lawn chairs, storm doors, rain gutters, soda and beer cans, foil and any other aluminum item that a less, should I say... "mad-scientist-inclined" individual may discard. Now this is a beautiful site (at least to me it is.) Here are three molds fully poured. The two on the left are made up of oil bonded sand and the one on the right is made from homemade molding sand. Ah yes! Here we have a cupcake pan with extra aluminum poured into some of the cavities. These are called ingots. 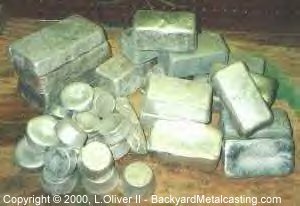 Ingots are simply "chunks" of clean aluminum (or whatever metal you're melting.) It is important to melt more metal than you need to fill all of your molds because melting too little metal is, well... really annoying (at least from what others have said.) I of course have never made such a silly mistake! (okay, maybe once). 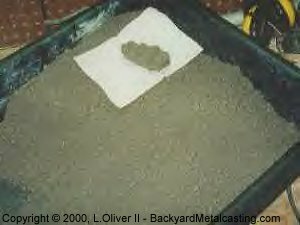 Just pour the excess into your ingot mold and you'll have clean metal to re-melt. 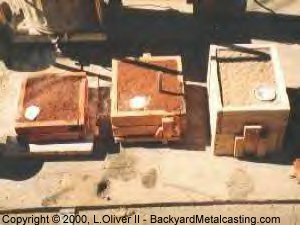 The castings are actually a higher quality (at least in theory) because since you are melting clean ingots you actually clean the metal twice. In my experience the best castings come when the metal is skimmed until looks clean and is not too hot. This is a mound of clean ingots. There are about 40 or 50 pounds of aluminum here. The small rectangular ingots weigh 4 pounds each. The cup cake shaped ones are maybe 6 ounces (I didn't weigh them) and about 8 pounds for the larger rectangles (made from a standard size bread pan) on the left. Here is bin of homemade molding sand. I made it from a mixture of fireclay and clean sifted sandbox sand. It is tempered with just the right amount of water to hold together well but not so much water as to flash evaporate and leave steam bubbles in the casting. On the piece of paper in the bin is a clump of sand squeezed into a cylinder shape with my hand. Well tempered sand will hold together well, show good detail and break apart cleanly. I read in a popular metalcasting book that wood flour (or baking flour if that's all you have) should be added to the mix when making it. For the love of god, don't do it! I didn't notice any benefits from it and worst of all it stinks, no... reeks of funk, rot and filth like you wouldn't believe for days until the rotting flour is finally eaten up by mold, fungus and various microorganisms. This is a bin of commercially made oil-bonded sand. Originally it was bright orange but it darkens with use. The sand in immediate contact with the molten metal turns jet black and dry as the Sahara. 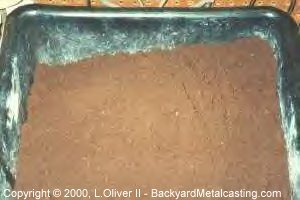 The manufacturer suggests removing the blackened sand and collecting it in a separate container to be retempered with their "special oil" and "resin catalyst" when enough accumulates. I separated it for a few castings but abandoned the practice after getting tired or scraping, carving and chipping burnt sand from the remains of intricate ornamental casting molds. So now I just mix it all back together and retemper it with oil after every use. Don't tell the manufacturer but I never used their "special" oil and I surely didn't use any of the advanced "resin catalyst" that they talk about. I simply retemper it with used cooking or motor oil or a combination of both! DO NOT use anything more combustible than motor oil! Since I don't use any resin catalyst the sand's consistency is slightly different but it works just fine. Copyright © 2000, 2001 by Lionel Oliver II All Rights Reserved.